Ships direct from vendor. Allow 2-3 weeks for standard delivery. 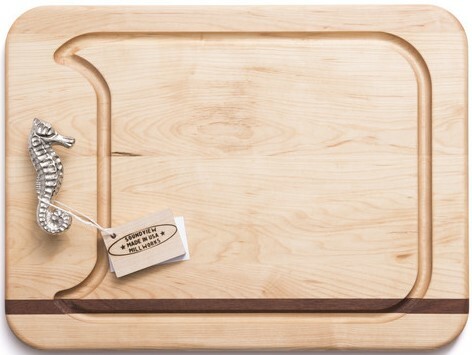 These appetizer boards are great for cheese and crackers or serving up that special dish. 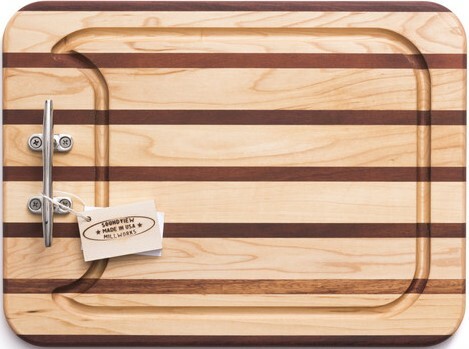 The boards feature a stainless nautical cleat, rounded corners and elegant, recessed juice groove, and our signature maple and mahogany design. The single cleat board is designed for use at home or on the boat, and can be personalized with engravings. Size Options: Large: 20" x 15" x 1"; Medium: 16" x 12" x .75"; Small: 13" x 10.5" x .75"
Note: A $10 vendor drop ship fee will be added to your total purchase for these products. 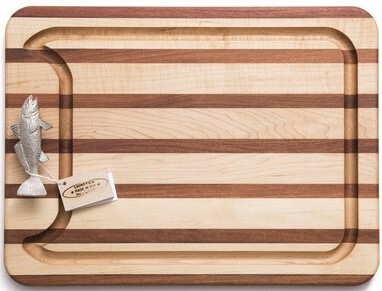 While your board has been lovingly prepared and finished for you by our hands, it's now time for you to continue to care for it! 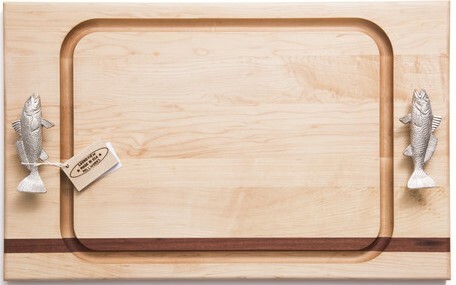 Wooden boards, bowls, boards and utensils need care and oil. We recommend keeping your board coated liberally in Mineral Oil, if you want to get fancy, melt some bees wax into the oil and apply it to the board when dry and clean. Let it sit overnight and wipe off the excess. The bees wax will help keep the pores of the board sealed and give your item a natural luster. There is no science to when to care for your board, if it looks dry, give 'er a coat. 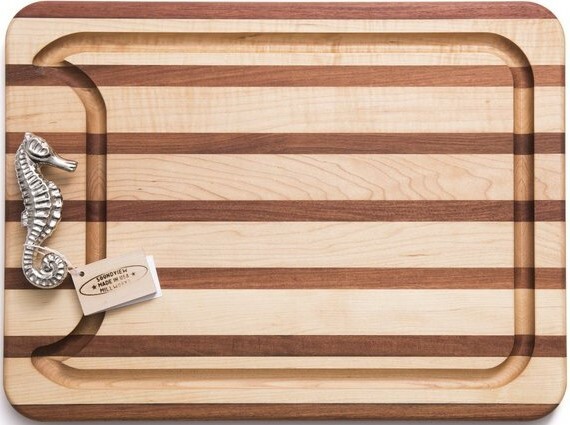 You can also use a butcher block oil or item similar for wooden cutting board treatment we don't recommend vegetable or olive oils as they can go rancid. 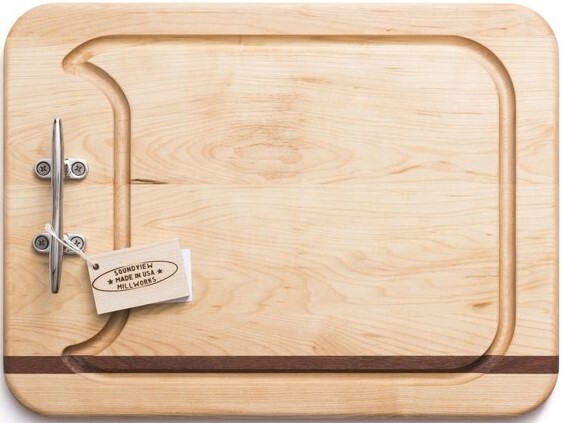 Wooden cutting boards should NEVER be put in the dishwasher. To clean your board, simply wash it with light soaped water, and towel dry it promptly after washing. Don't place a wet or damp board on a flat surface as the moisture will get trapped between the board and surface -- perhaps sent it up against a back-splash and rest it upside-down on the handles for air to freely flow around it. You can use salt and a freshly cut lemon half to clean the board if some staining occurs (google this practice, its great!). Store your board in a temperate dry place -- remember, moisture and temperature changes are enemy #1! Be sure to re-coat your board if it beings to appear dry. All processes and purchases are up to the strictest Forestry Stewardship Council Standards (FSC), and promote responsible management of the world's forests. Your Price: 2 Sizes, From $150.